I think it was in a 2007 issue of the local edition of ELLE in which I got a 4 page interview with Baloji published, that the last lines of my feature read : "There is no happy ending to this story, since there is no ending in sight. Baloji is just getting started. What we have for now is a music mogul in the making, a multi-faceted artist who will one day publish great books with the same ease as he is making amazing music." I wrote that following a paragraph of Baloji recounting the heartbreaking moments during which he first sat down with his mother again in Congo after being separated from her for more than two decades. He proudly gave her the first copy of "Hotel Impala", the album he wrote for her. She disapproved, as she was expecting a more "substantial" gift from her long lost son. Baloji added : "Later on she thought her reaction was a bit funny and she was ecstatic about our reunion, but in that first moment, I felt really small." Looking back, this was a time when it could be forgiven (or not) to think that "becoming a mogul" should be a priority. For me it felt just extremely important to state my unwavering trust in my friend to both himself and the world at the same time. Eight years later, Baloji's bio that accompanies the release of the range of sunglasses he curated for Belgium-founded brand Komono, reads that he is a poet, composer, writer, beat maker, an actor, performer, stylist and video artist. Colour me proud, but also extremely unsurprised. First things first though, it's 2015 and after the aforementioned solo-masterpiece "Hotel Impala" and the critically acclaimed Congolese re-interpretation "Kinshasa Succursale" and more than 200 live shows (watched and loved by Bono, Damon Albarn and Miuccia Prada to name but a few), Baloji just dropped the first song and self-directed video from his upcoming EP "64 Bits and Malachite", called "Capture" ft. Petite Noir & Muanga, which he wrote with Metronomy's OLU and is produced by Thomas Azier. 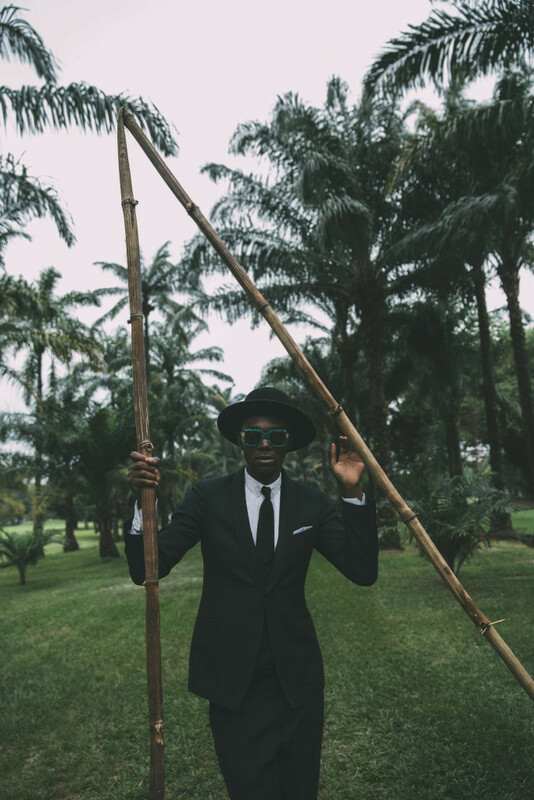 In the wake of his videorelease, Baloji just announced the drop of a "Komono curated by Baloji" -collection, which features 4 types of sunglasses all with a special meaning. Remember how I talked about Baloji's mother at the beginning of this post. I wonder how she reacted when he told her the news of this beautiful tribute. Baloji on the "Mujinga"-model: "It was thanks to my mother's big, almond-shaped eyes that I recognized her amidst the crowds in Lubumbashimarket when we met for the first time after 25 years, a reunion that inspired this “Cat’s Eye” shape. Big eyes attract attention and betray your thoughts: glasses can act as protection and disguise. Gold emphasizes the eyebrows, creating a distraction and the gold teardrops are like a permanent reminder of the melancholy that inhabits these women." Pierre Mandjeku "Dizzy" first and foremost is EVERYTHING. He is a legendary Congolese guitarist and has been a member of Baloji's band for some years now. Baloji created the "Dizzy" frames with him in mind. Baloji : "Dizzy is more than a band member; he is a role model, a surrogate father, and undeniably the most elegant musician ever. The Dizzy frame is a true artist’s style to be worn on stage, yet the small details make these sunglasses classy and elegant." Baloji : "Tshala Muana AKA the Congolese Donna Summer, a living legend. With hypnotic trance rhythms, her music finds its natural extension in a secular dance: the Mutuashi. Tshala was a pioneer in an era where most women in music were little more than arm candy or dancers. Her apparently frivolous music and provocative choreography tackles big questions: the role of women and their right to pleasure in African society. She inspired me to develop this libertine style with feminine gold rims: more than sunglasses; they are a statement." 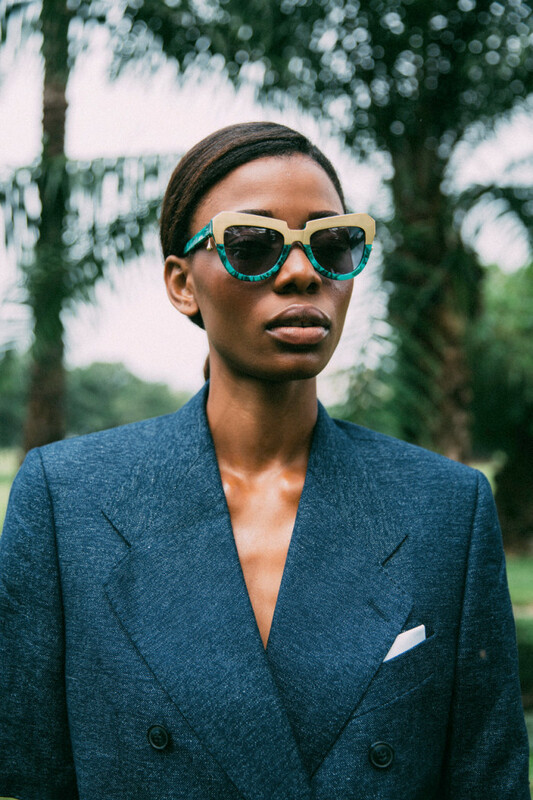 Baloji on the "Kitoko"-model : "The over-sized Kitoko frame is inspired by 80s hip-hop styling and above all, by the glasses worn by Baudouin I, the Belgian king, nicknamed “Mwana Kitoko”, meaning ‘beautiful white man’, or ‘handsome young man’ in Lingala. Baudoin influenced the European inspired, middle class stylistic movements of the 1960s, which helped shape the tradition of Congolese elegance. Smart urban wear and an eye for detail, used to personalise an outfit, not provoke a reaction." All sunglasses are made with malachite acetate exclusively developed by Komono. 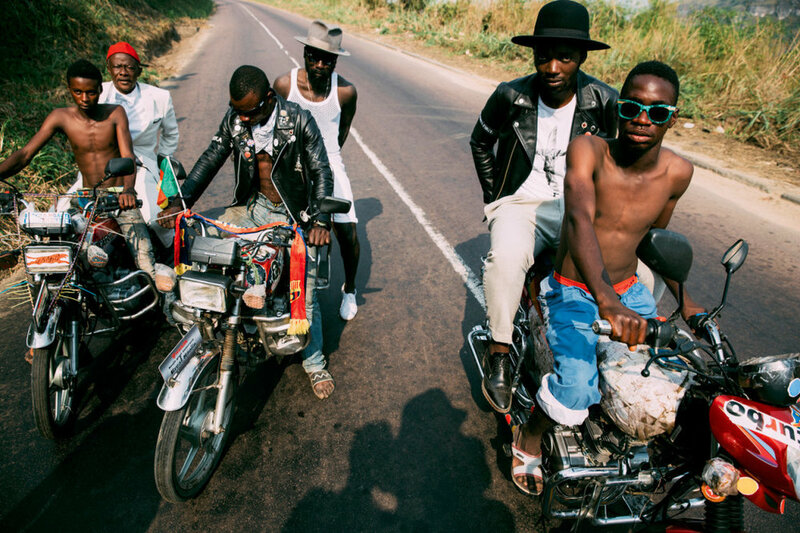 The "Komono curated by Baloji" capsule collection is now available here and will be released in selected stores later. Stay tuned for the drop of "64 bits & Malachite".